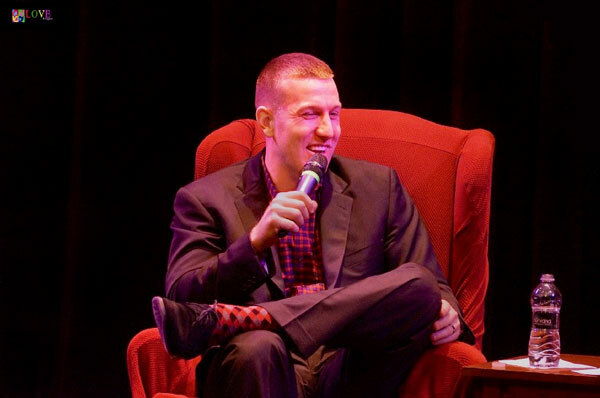 Baseball’s Todd Frazier Speaks at Toms River’s Grunin Center! 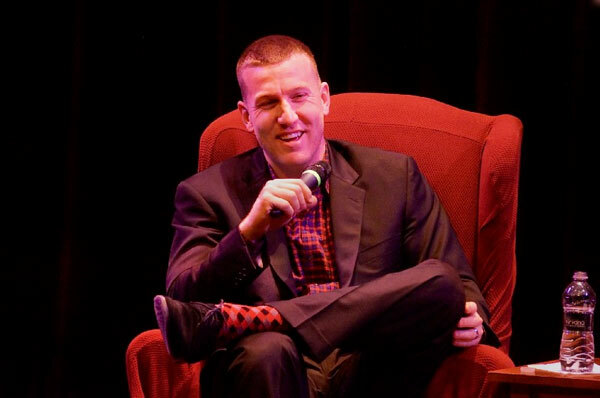 Toms River, NJ hometown baseball hero Todd Frazier presented an evening of baseball talk on Friday, January 19, 2018 at Toms River’s Grunin Center of the Arts. 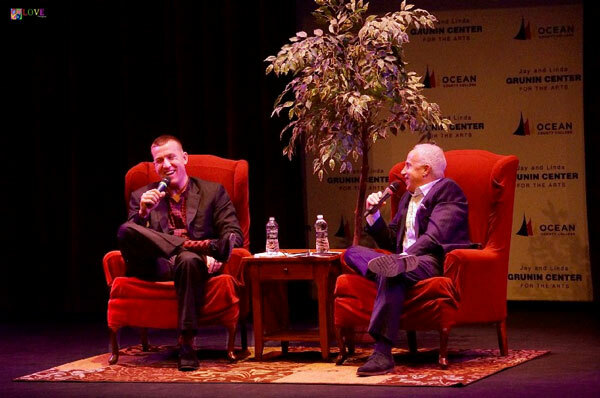 Along with moderator Russ Salzberg, Todd discussed his experiences growing up in Toms River and playing baseball all the way from his days as a Little Leaguer to his current status as a reigning MLB superstar. Frazier — who was born in Point Pleasant, NJ — grew up in Toms River. 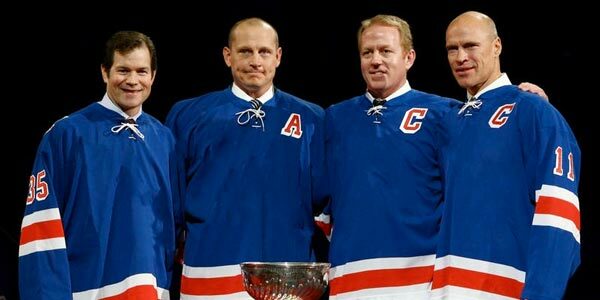 He first gained international fame at the age of twelve when he led the Toms River East American team to the 1998 Little League World Series title. Nicknamed the “Beast of the East” for their power, skill, and gorilla mascot, the team went undefeated in the tournament. To celebrate their Little League world championship, the team was invited by the New York Yankees to a game where each player was introduced to the crowd and invited to stand next to his Yankee position counterpart during the playing of the national anthem. As a shortstop, Frazier was thrilled to be able to stand next to New Jersey native Derek Jeter. After playing baseball for Toms River High School South — where he was coached by Ken Frank, currently ranked the #15 coach in the United States — Frazier went on to play for Rutgers University where he became 2007’s Big East player of the year. A first-round draft pick of the Reds in 2007, Frazier was an All-Star for the first time in 2014 and, in 2015, was voted to start for the National League at third base. After the 2015 season, Frazier was traded to the Chicago White Sox, and before the 2017 trade deadline, the White Sox dealt Todd to the New York Yankees. In New York, Frazier established himself as a key player in the Yankees’ push to the playoffs where, against the odds, he helped to propel his team to the seventh game of the AL Championship Series. 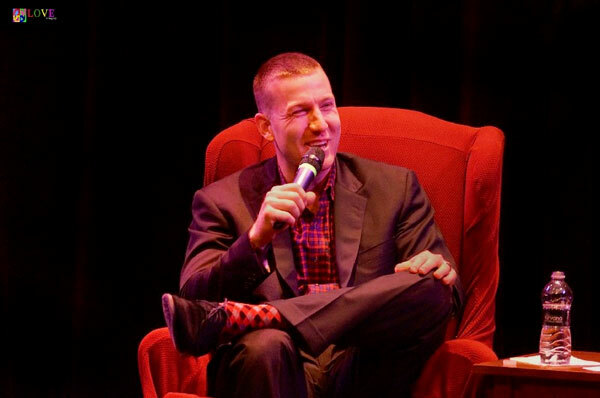 At Toms River’s Grunin Center — located on the campus of Ocean County College — a sold-out audience of baseball fans of all ages is patiently waiting to hear Todd Frazier speak. Local filmmaker Sandy Levine takes the stage to welcome the crowd to tonight’s special presentation focusing on Toms River baseball. Levine starts the evening off by sharing a clip from her upcoming film about Toms River High School South baseball coach, Ken Frank, entitled South Baseball: The Spirit of Winning. Revealing that the film’s premiere will take place here at the Grunin Center on April 8, 2018, Levine introduces Ken Frank — the head coach of South baseball for 40 years, and the winningest coach in New Jersey — who stands at his seat to avid applause. Levine also introduces long-time NYC sportscaster Russ Salzberg, whom many in the audience recognize from his appearances on FOX 5 and MY9 television, in addition to his work on WFAN sports radio. Lastly, she introduces to the stage Toms River’s hometown hero, Todd Frazier. 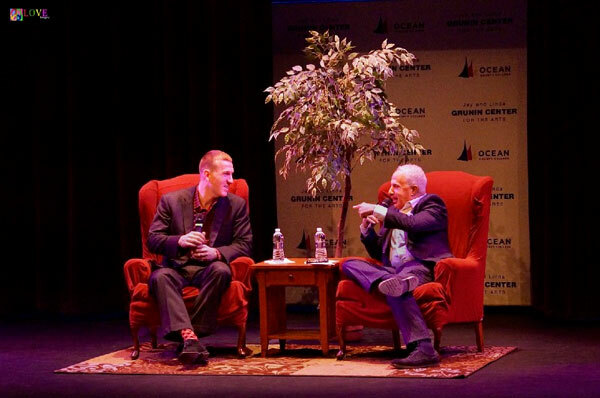 Salzberg and Frazier greet the audience before settling down into oversized chairs and engaging in lively conversation. Salzberg starts off by asking Frazier what team he intends to play for next season. Salzberg takes the final segment of the evening to open the floor to audience questions. Several of the evening’s questions, however, come from some younger baseball fans in the audience — a few coming from a trio of Little Leaguers from Kingswood Township, NJ — Jack, Nicky, and David. Jack, 8 — who plays for the Lions — asks Frazier, “What would you be if you weren’t a baseball player?” to which Frazier responds, “I’d be a special education teacher,” noting he went to Rutgers University as a communications major. 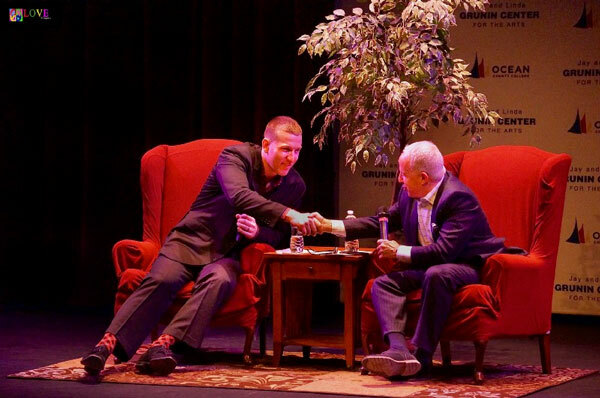 After Frazier and Salzberg shake hands to a standing ovation from the hometown crowd, we chat with several members of the audience who share their thoughts on tonight’s presentation with Todd Frazier. We also chat with Barbara Koehler, one of the sponsors of tonight’s program, who brought her son and grandson to this special event. 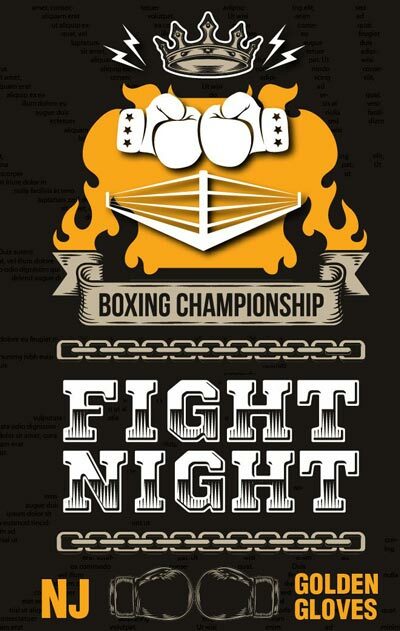 “We thoroughly enjoyed this evening!” exclaims Barbara, owner of Mathnasium — the math learning center — located in Toms River. Lastly, we catch up with with Jack, Nicky, and David — the three Little Leaguers whose questions were featured during the audience participation portion of the evening. 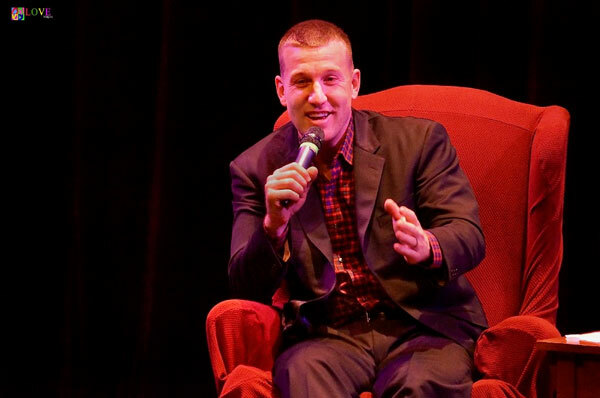 In addition to these three up-and-coming baseball players — who likely will never forget having a chance to chat with one of baseball’s reigning superstars, the rest of the sold-out crowd at the Grunin Center surely also left with fond memories of spending some quality time with their hometown baseball hero, Todd Frazier. 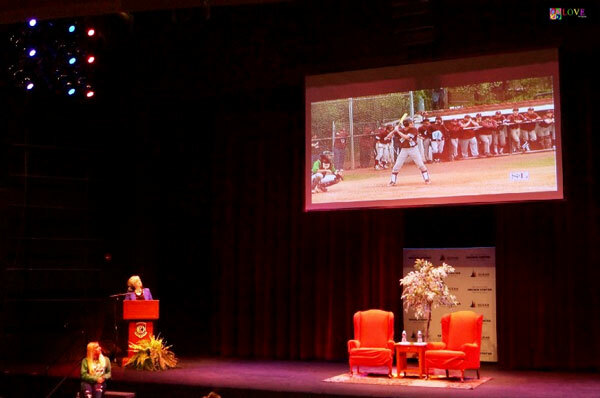 For more on Sandra Levine’s film, South Baseball: The Spirit of Winning — which debuts at Toms River’s Grunin Center on April 8, 2018 — please go to grunincenter.org/event/south-baseball-spirit-winning. For information on additional events at The Grunin Center — including American Idol’s Michael Lynche on Feb. 17, 2018, An Intimate Evening with Rickie Lee Jones on March 22, 2018, and a lecture by Erin Brockovich on April 12, 2018 — please go to grunincenter.org.